Client reporting is a tough job for marketing agencies. It takes a lot of time to collect information, analyze it and prepare a detailed and insightful report. To overcome this challenge, agencies use automation tools that help save time and free it up to more creative tasks. The popular metrics and statistics marketers usually put into client reports include Conversion (leads, CPC, revenue), Traffic (sessions, pages, referrers), SEO (ranks), PPC (CTR, impressions, ROI, ad spend), Social Media data and Email Marketing stats. These metrics are easily reported from cloud apps and platforms. Financial projections and many more. 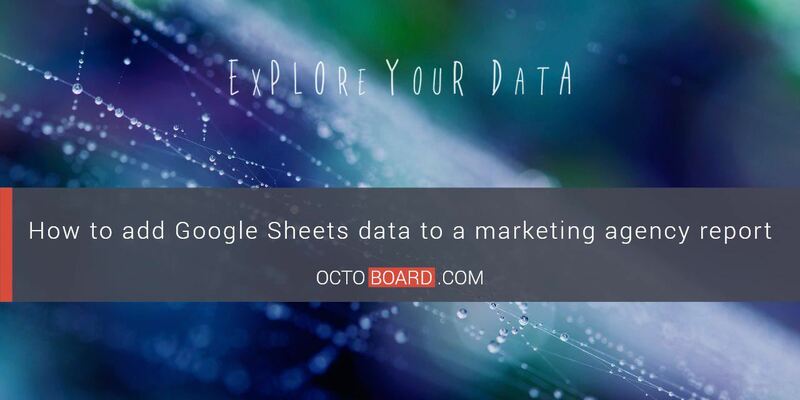 Marketers store this information differently, and Google Sheets is one of the most popular ways to manage important business data. 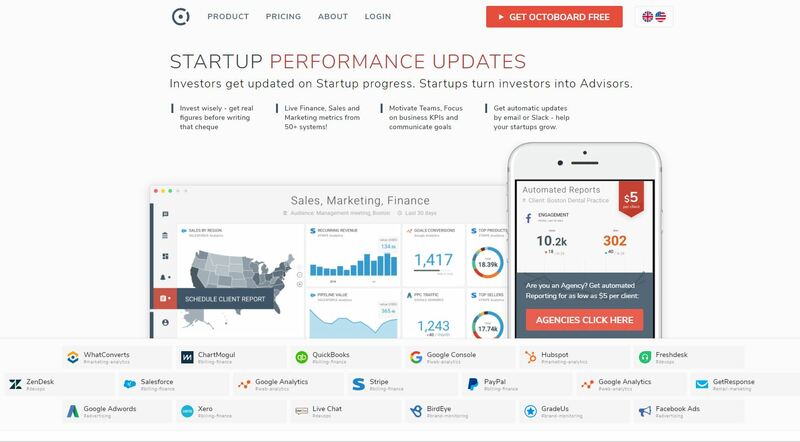 Octoboard offers an automated reporting solution for marketing agencies and business owners. The “all-in-one” software tool helps create customizable White label reports for clients when each report takes no more than a minute to prepare. 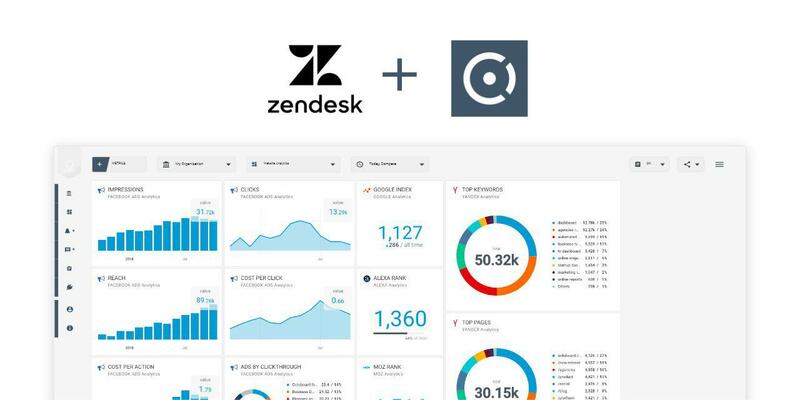 We have already shown how users can add different data to marketing reports from our 50+ integrations: Twitter, Google Analytics, Instagram, Facebook, YouTube and many others. But sometimes data is stored in spreadsheets, for example, financial or sensitive information that does not show up in Social Media or other platforms. 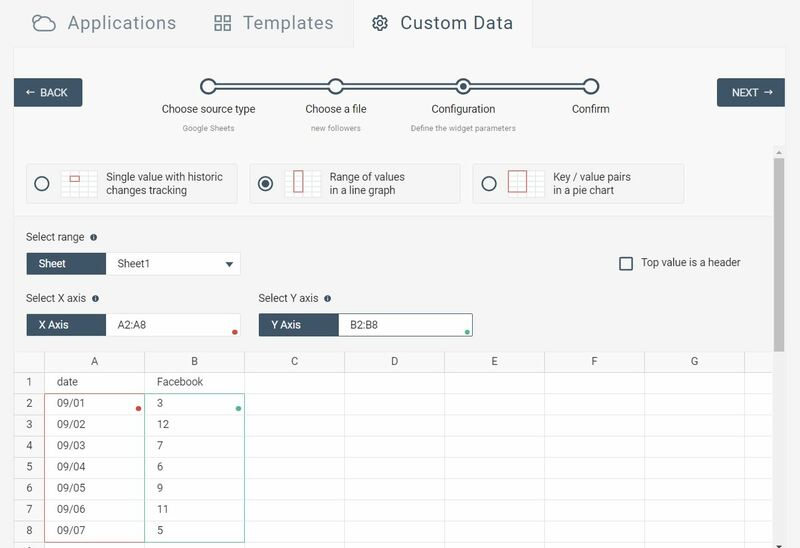 For this, we provide a useful Google Sheets integration – one more way to manage, display and report your data quickly and without much effort. 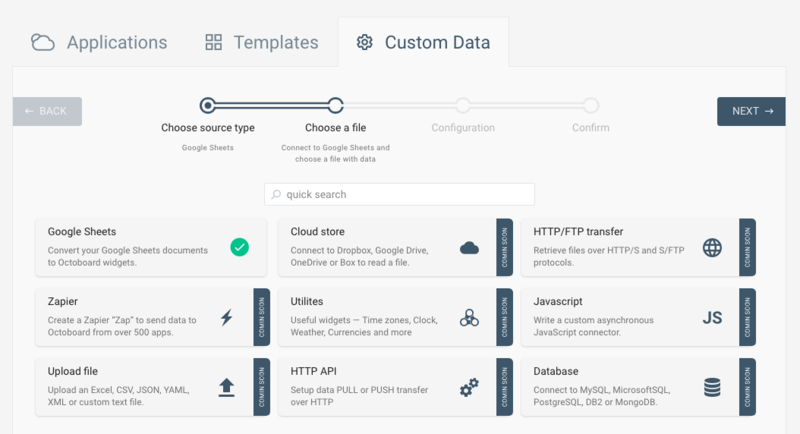 Category data – displayed in pie charts, tables or funnels. Access Google Sheets wizard pressing ADD METRIC button and selecting “CUSTOM DATA” tab. It’s important that you have the ability to link the sources you already use: Google Analytics, Yandex.Metrica, Moz, Alexa, WordPress, Facebook, Twitter, Linkedin, Instagram, etc. Octoboard has 50+ integration – you can connect all the popular platforms. 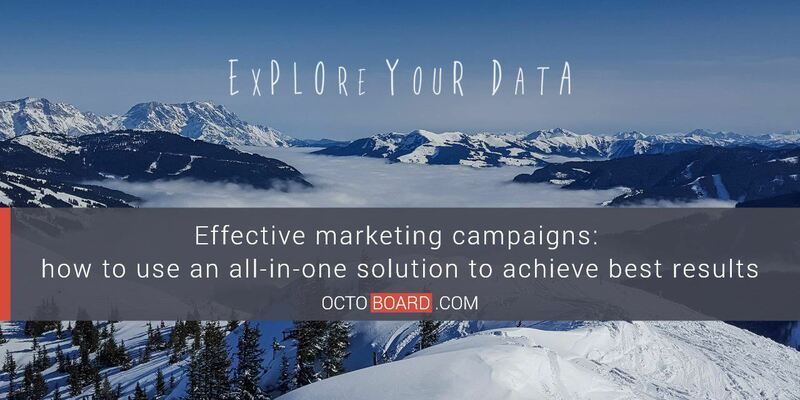 Octoboard offers a variety of plans to fit every business – from startups to big marketing agencies and enterprises. Individual plans are also available. Using Octoboard is intuitive and easy, you do not have to be an IT specialist. In-depth reporting it is achieved by multi-channel data tracking and effortless and, at the same time, detailed reporting. If you want to make your report your own by either adding your logo or your client’s logo, you should be able to. The same goes for corporate colors and text adding – your automated reports should have these features. 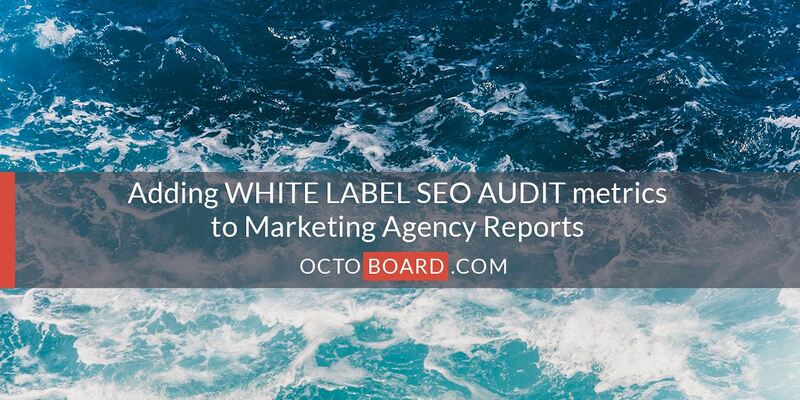 Octoboard provides a White label feature that is much appreciated by marketing agencies all over the world. 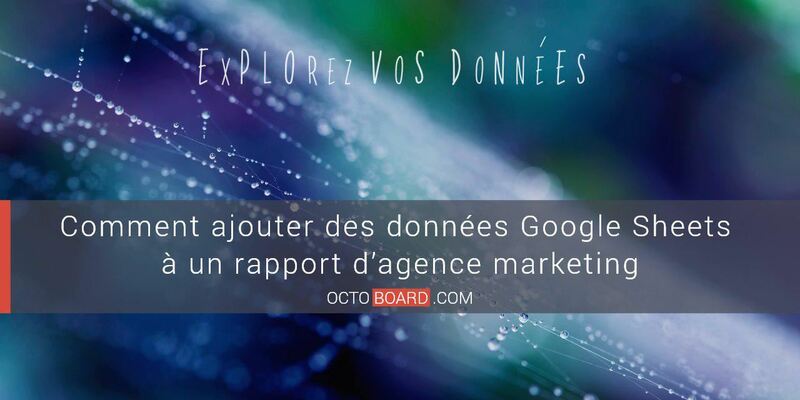 It does not take more than 1 minute to create an automated report using Octoboard solution. Automation should not stop at generating reports – it is very important to be able to schedule and send it automatically to your clients as well. Octoboard allows you to do that quickly and without effort. 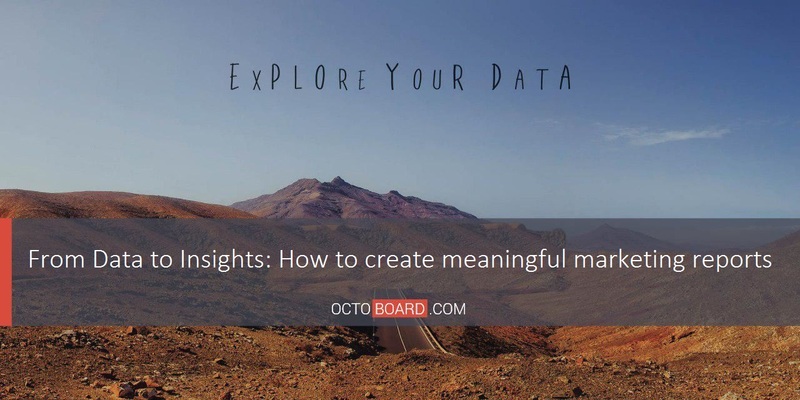 Clients appreciate clear data in reports and Octoboard provides it. Report automation saves a lot of time and reduces a large amount of manual work. Automation is a necessity for every marketing agency with a lot of clients. If you do not use it, you fall behind your competitors. Join Octoboard today and save time while adding value to your clients!